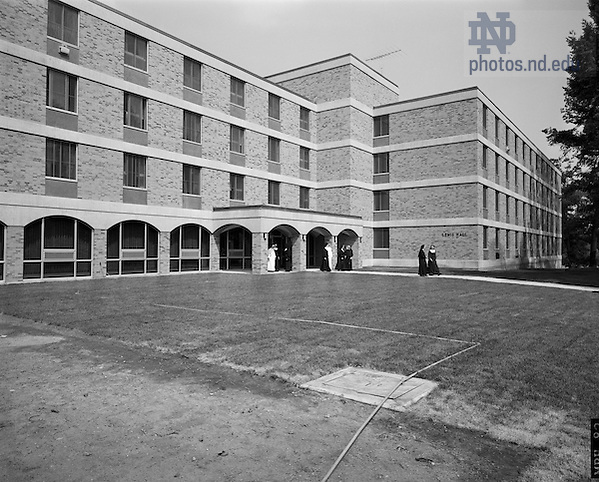 On August 10, 1965, Notre Dame dedicated its first dormitory built specifically for female students. 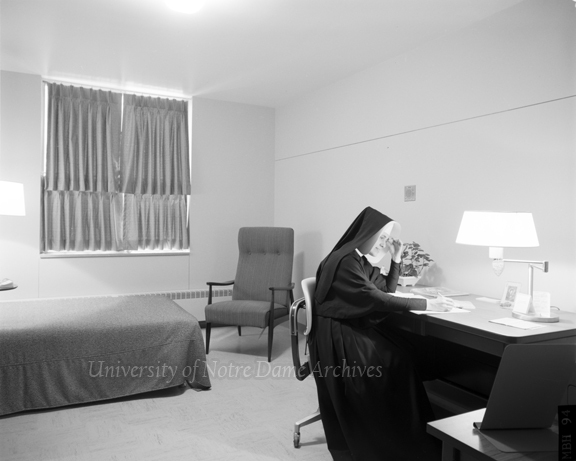 Lewis Hall was originally built as a residence for the religious women pursuing advanced degrees at Notre Dame, accommodating 143 nuns, all in private rooms. It would later open to include female lay graduate students as the number of religious declined. In 1975, Lewis was converted to a residence for undergraduate women and the single rooms were turned into doubles. 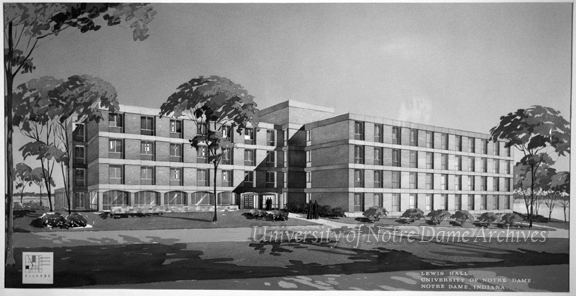 Architectural sketch of Lewis Hall by Ellerbe Architects, c1962. Holy Cross Sisters Mary Frances Jerome (MA in Greek Literature) and Mary Lucretia (MS in Chemistry) were the first two women to earn degrees at Notre Dame in 1917. 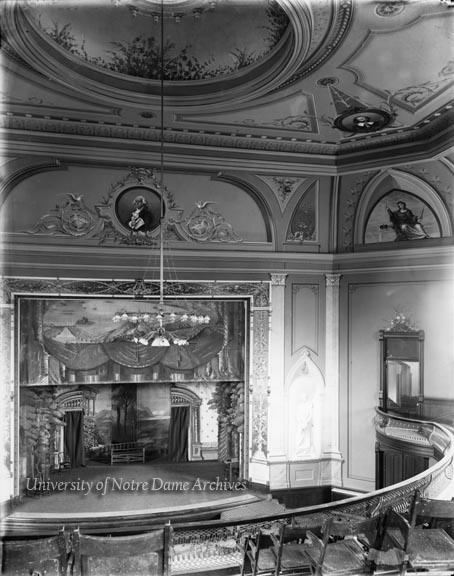 The formal establishment of the Summer School Program in 1918 and the Graduate School in 1932 brought thousands of women to Notre Dame from across the country. Since most did not live locally, they did their coursework over the summer sessions, dragging out the time needed to complete their bachelors, masters, and doctoral degrees. Lewis Hall exterior with female students, 1965. On April 28, 1962, University President Rev. Theodore M. Hesburgh announced a million dollar donation from the Frank J. Lewis Foundation for the construction of a dormitory for these women to live on campus year-round and earn their degrees. As such, they could earn a masters degree in 15 months rather than over five summer sessions. Hesburgh said, “the new hall will accelerate the graduate training of the devoted women who constitute the heart of Catholic education in America” [Notre Dame Press Releases, April 1962]. A female student studying in her private room in Lewis Hall, 1965. Chicago business man Frank J. Lewis unfortunately had passed away in 1960 before he could see his foundation fund Lewis Hall. Before they were married, his future wife Julia founded the Illinois Club for Catholic Women in 1919, which was “a home for young Catholic business women away from home and in modest circumstances.” The couple was extremely active in philanthropic work throughout Chicago and “their outstanding contributions toward the development of Catholic higher education [was] so great as to have earned them the title of Godfather and Godmother to Loyola University, DePaul University, Lewis College at Lockport, Illinois, and others.” Frank believed that “God gives a man money so that he will share it with others” [UDIS 99/15]. Lewis Hall Dedication, 1965/0810. Rev. 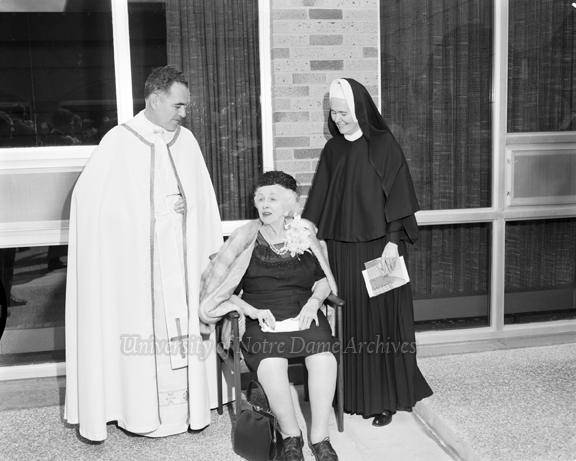 Theodore M. Hesburgh, Mundelein College President Sister Mary Ann Ida Gannon, and Mrs. Julia Lewis. In a move to eventually make space for all women undergraduate students who chose to live on campus, Lewis Hall’s resident profile changed in the fall of 1975. The graduate students were moved to Badin Hall for the year in the anticipation of the opening of the Grace O’Hara graduate student apartments in 1976. The undergraduate women living in Badin Hall since opening to women in the fall of 1972 were moved to Lewis Hall in the interim. 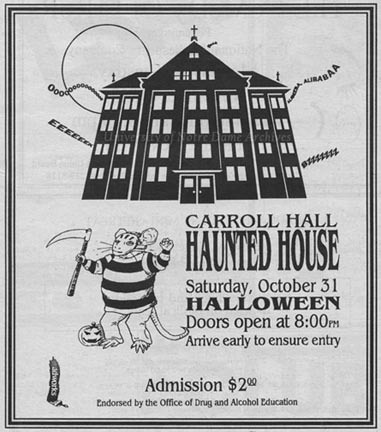 Badin Hall returned to house undergraduate women after this one year shuffle. 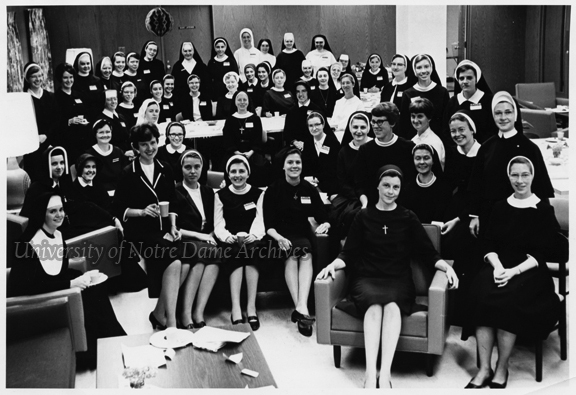 A group of Notre Dame female students in a Lewis Hall lounge, Fall 1967. While the move initially upset students all around, Notre Dame saw it as the best option available to facilitate the graduate and ever-increasing undergraduate women, without further displacing the on-campus male students. 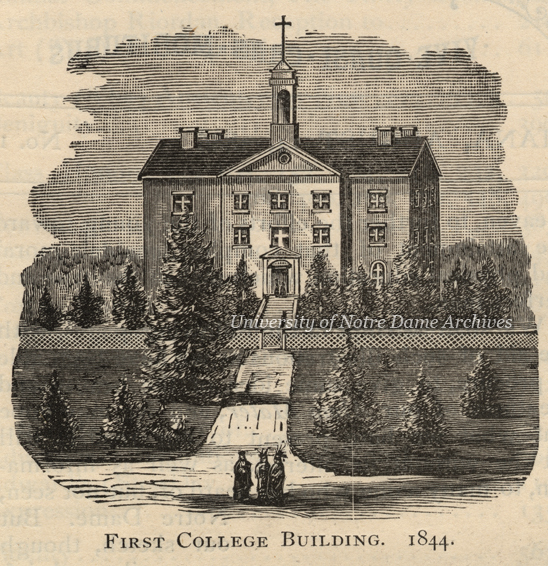 Even though graduate students are often overlooked on campus, Lewis Hall plays a very important role in the history of coeducation at Notre Dame.